Thomas Mitchell, of Kings High School in Kings Mills, follows through after booming a field goal through the uprights June 23 at Doug Adams Stadium in Xenia. 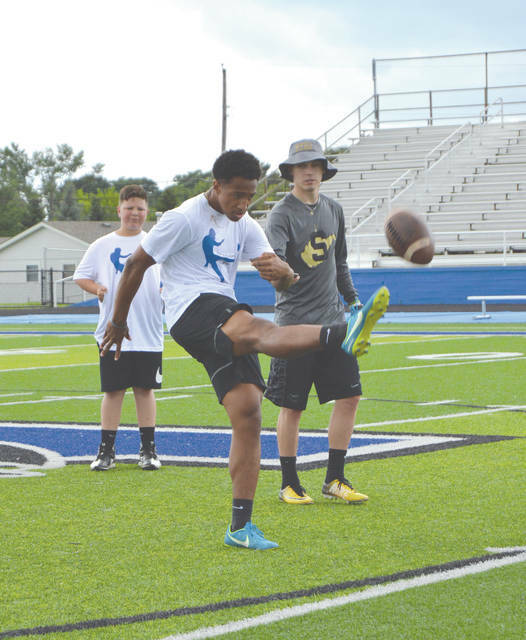 Camp director Kole Patterson (with hat) times a punter’s hang time, which is the amount of time the ball stays in the air, June 23 in Xenia. The longer the hang time, the better chance of the punter’s teammates being able to get downfield to get the punt returner. Staff and participants in the inaugural KP’s Kicking, Punting and Long Snapping Camp pose for a group photo, June 23, at Doug Adams Stadium in Xenia. XENIA — He wanted to give something back, and so Kole Patterson did it the best way he knew how. 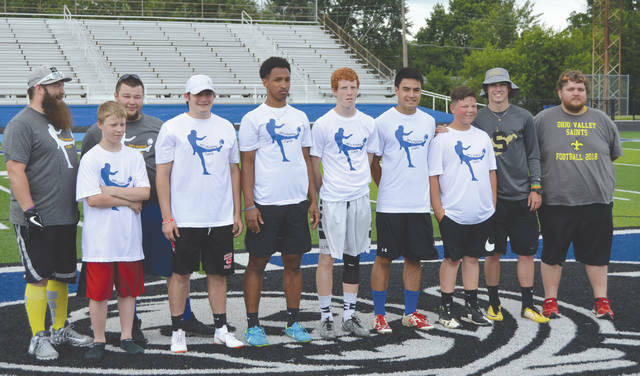 Pattterson, a 2013 Xenia High School graduate and a recent West Virginia State University grad as well, held his inaugural KP’s Kicking, Punting and Long Snapping Camp, June 23 at Doug Adams Stadium. XHS junior-to-be Brett Russell and Carroll High soon-to-be senior Johnny Biering were among the high school and middle school participants in the camp. Biering came away sure that he’d improve upon his 29.6-yard average from last season. Patterson had experience both as a placekicker and a punter, and so the 5-foot-9, 160-pounder gave the campers instruction in both facets of the game. “For the most part, I was just going over stuff that I had learned when I was going through my own progressional stages of kicking,” Patterson said. “Going into my junior and senior years of high school here at Xenia, my coaches helped me a lot. So when I graduated from West Virginia State in May, this was the first thing I wanted to do. He garnered enough sponsorship from area businesses to hold the camp for free. The Ohio Valley Saints semi-professional football team helped cover the insurance aspects of the event, and a few members of the Saints were on hand to help out with the camp. “These kids are out here wanting to learn a specialized thing, a technique that not a whole lot of people in this area coach,” Patterson said. 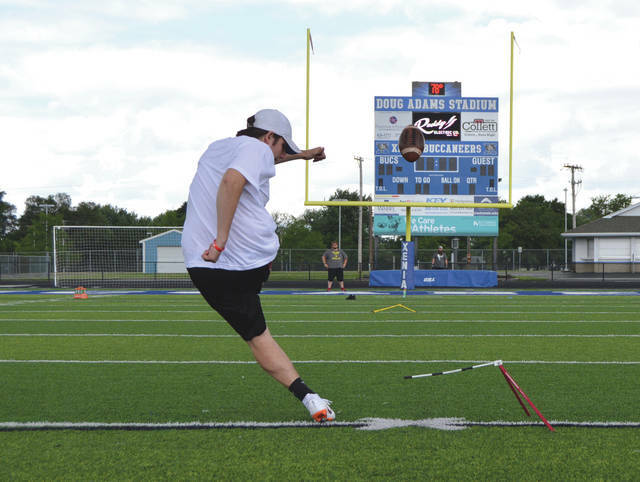 For high school student-athletes looking to find a way into college on a football scholarship, place kicking and punting may be a good option. Patterson says his alma mater is one of those schools who are looking for a new punter for the upcoming season. “I was the starting punter at West Virginia State, and I know they’re looking for somebody. Last I had heard, the University of Minnesota, a big Division I, Big Ten school, was looking for a new kicker. It’s kind of like quarterbacking, where teams won’t always need a new replacement for the guy they have. But every now and then when their kicker graduates, schools will be scrambling to find their replacement,” Patterson said. Xenia’s Russell averaged 25.7 yards per kick last season as a sophomore. That was second only to graduated senior Meechi Harris’s average of 31.4. On Saturday, he too was booming punts in the 30-plus range with regularity. “KP’s” camp has Russell ready for the fall as well.